How do I Belly Dance for Fitness? Pregnant women should consult a doctor before beginning a fitness routine. In order for an individual to belly dance for fitness, she should start by learning a few simple moves. A woman with a toned belly. Like any type of aerobic activity, belly dancing can help you achieve your fitness goals. Belly dance combines the fun of learning a new type of dance form with a rewarding physical workout. You can belly dance for fitness by concentrating on fat burning exercises and increasing the length of your workout sessions. Health professionals generally recommend at least 20 minutes of aerobic activity three times a week to maintain a healthy physique. Individuals who wish to loose weight usually need to spend more time exercising and to eat low-fat and low-sugar foods to decrease their caloric intake. Consult a physician before attempting any exercise regime, especially if you have medical conditions like diabetes or high blood pressure or are pregnant or breastfeeding. In order to belly dance for fitness, you should start by learning a few simple moves. Although belly dancing uses the entire body, many of the exercises focus on the chest, abdomen, and hips. Do not be discouraged if you don't complete the moves correctly the first time you try. Many of these exercises are complex and will take practice. 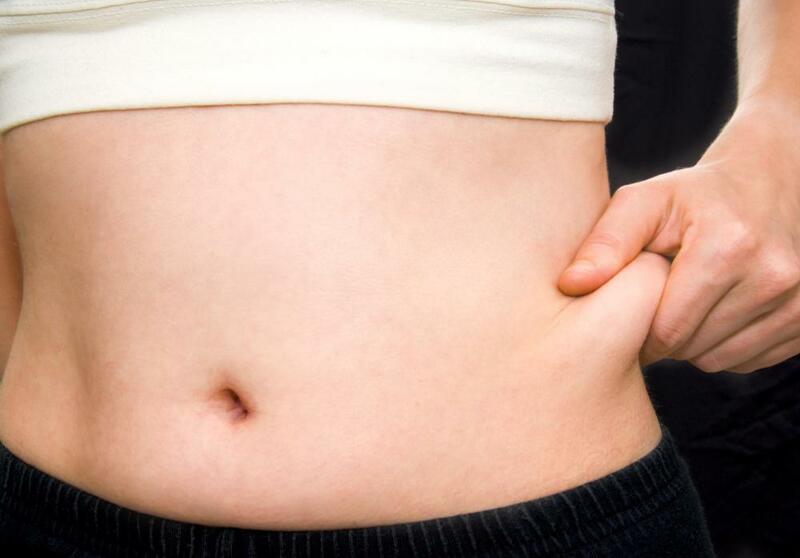 First, try a belly roll, which focuses almost exclusively on your abdominal muscles. Roll your abdominal muscles down from the rib cage and back up from the lower abdominal area. It helps to practice this move while seated, so that your hips and buttocks do not move. It might also help to practice in front of a mirror. For extra practice, you can do belly rolls while you are in the car or watching television. The chest lift and chest slide use your back and abdominal muscles. For the chest lift, stand with hands on hips and feet shoulder width apart. Simply drop your shoulders, raise your chest, and then relax into a neutral position. For the chest slide, shift your chest to the right, allowing only your chest to move. Slide your chest to the left and then return to a neutral position. After you have learned the chest lift and chest slide, you can practice a chest circle. Slide your chest to the right, and then, lift your chest up and slide to the left. Pull in and slide back to the center from the left. When first completing this move, it may feel like you are moving your chest in a box shape, but try to smooth the movements into a circle without moving your hips. Complete this move in clockwise and counterclockwise directions. To exercise your hip muscles, try a a hip shimmy. This move is actually performed by using the knees to shift the hips back and forth. Stand with your feet together, and bend your right knee. Allow the right hip to drop slightly, and straighten your right knee while bending your left, allowing the right hip to come up and the left hip to drop. Try to keep your hips relaxed and loose, so that the motion remains smooth. With practice, you can do hip shimmies quickly. Sometimes it helps to add a hip scarf with coins or bells so that you can hear when each hip drops into place. It may also help to practice in front of the mirror. Remember not to pick your feet up, and to try to keep your hip movements fluid. If you are having trouble staying motivated in your workout, consider joining a class. Many gyms, dance studios, and community centers offer belly dance classes. You might find that it is easier to belly dance for fitness if you have a regular schedule of classes to attend. You might also try purchasing a belly dance for fitness video, or watching belly dance tutorials online. What Is a Circle Dance? How do I Choose the Best Dance Exercise Videos? What are the Benefits of Belly Dancing Classes? What are Dance Fitness Classes? What are Different Types of Dance Costumes?